I got my first Vyper finished the other night. I'm hoping to get another one done this weekend. After seeing a color picture of some Saim-Hann Vypers, I thought I would paint the Pilot to look like he was being illuminated by the instrument panel. Since this post is fairly old, I decided to go back and add a few links to additional posts to help readers out with seeing how things were done. Really great model, and a paint job to match. The green glow looks realistic, nicely done. Thanks Andy, at 500 points, these guys are the workhorses of the force. With the canopy in place, you can see just enough of the green that it catches your eye but doesn't stand out too much. 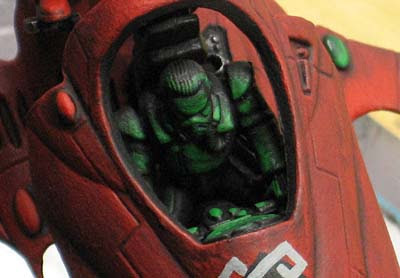 Whilst this may seem a rather basic painting/highlighting question, how did you manage to achieve the 'burnt' look of the red? Is it simply a case of drybrushing red over a black undercoat or more than that? closet gamer: It's actually really easy to get the "look." I was explaning it to someone else yesterday. Give me a couple days and I'll put up a post about using the GW washes and how I highlighted the Vyper to get this look. It's not much more than just brushing the paint on though. 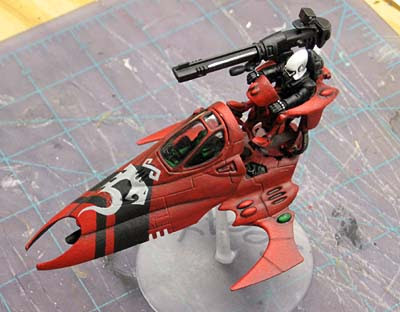 Looks like your saim hann is coming along rather nicely! Great model and painting there! Now we wanna see more! !